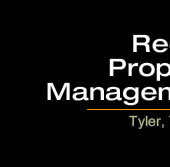 Welcome to the website of Reed Property Management LLC. We are a family-owned real estate entrepreneurship investing and property management company located in East Texas - within the lovely community of Tyler, Texas. We pride ourselves in a strong work ethic and a value system that moves us toward win/win results in our negotiations and involvements. We encourage you to make contact with us regarding purchases of real estate, residental rental housing, and property management resources. Looking forward to hearing from you! Go Directly to REED FAMILY RANCH webpage!